Cape Workshop is an annual event held by the Department in an effort to assist CAPE students with their end of year School Based Assessment (SBA). High Schools from all over the island are approached and offered this opportunity for their students to familiarize themselves with our lab equipment and get technical support from our experienced lab demonstrators and lecturers. The workshops focus on CAPE Unit 1- Mechanics (Motion) and CAPE Unit 2 - Operational Amplifiers of the Electronics section. These are found to be the most problematic areas of Physics at the High school level. These activities are designed to reinforce the theoretical knowledge while giving the students practical experience. 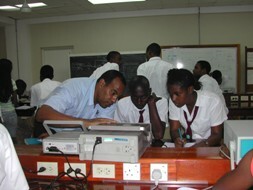 The Electronics Unit at UWI, Mona has prepared a building space to accomodate 36 students per lab session. These students will be from High Schools all across the nation. Notices will be sent out to these schools informing them of this activity and their visits will be scheduled for one of two four-hour sessions. Prepared lab experiments, components and manuals will be made available to all students upon arrival. These experiments will be both practical and simulated experiments based on topics that are being covered on their syllabus. We look forward to this activity and forsee a successful and productive outcome. The University's Outreach programme is a semi-annual event in which members of each Department, along with the admission team, travel to various schools to speak with students. These events occur September to December where they address 6th form students and again January to May where they address lower school students.